The power of music to move people to action and to make a difference has long been apparent to most Chapin fans, but are benefit concerts pretty much a thing of the past? Not in Hartford, Connecticut, where the University of Hartford has been hosting its "MUSIC for a CHANGE" concert series since 2000. Over the last five years, dozens of artists ranging from Richie Havens to Suzanne Vega to Wynton Marsalis have performed before thousands of enthusiastic fans and helped to raise more than $30,000 for local community causes. Among the many local non-profit groups that have shared in the success of the program are Foodshare (a local foodbank), the University of Hartford's Chapter of Habitat for Humanity, the Connecticut Special Olympics, and LUNCH (Local United Network to Combat Hunger). But it's not just the money that helps the organizations. MUSIC for a CHANGE has also provided very valuable publicity and new volunteers and supporters for the groups as well. 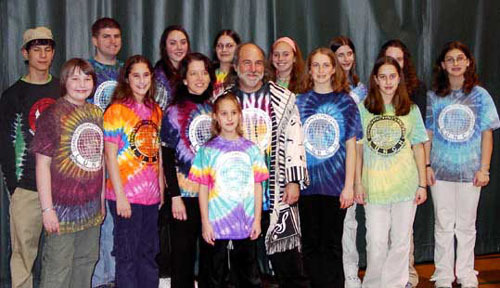 Irwin Nussbaum, Associate Vice President for Student Life and Director of the Office of Residential Life at the University of Hartford, began organizing the MUSIC for a CHANGE program after he managed a similarly successful program from 1980 through 1990 at Amherst College in Amherst, Massachusetts. Nussbaum said experience has taught him that it's not always the biggest names that result in the greatest audience response. "Although the midsize and larger concerts like Art Garfunkel, Sean Colvin, and Jonathan Edwards have the largest artist name recognition, sometimes the smaller, more intimate concerts leave the audiences raving about the performer," he noted. The key to the program is to partner with the local grassroots organizations that can help to promote the shows, and to provide them with an incentive to help maximize the success of the event, he explained. "In July, at the end of the concert season, I share the proceeds with the agencies who were co-sponsors during the year," he said. "The money is shared equally regardless of whether they co-sponsored a large concert or one of the smaller ones. It seems more fair that way." Nussbaum said he is confident the program has made a real difference — not only for the local organizations but also for patrons who attend the shows. "Between the artists' voices and commitment to social change, and getting familiar with our co-sponsoring non-profit agencies, I do know that some audience members became more civically involved." Upcoming shows include Irish humorist and storyteller Batt Burns, James Keelaghan, and a Tribute to Harry Chapin concert, which will be performed by LUNCH on April 8th.